About two months ago I created a series of wallpapers featuring Firefox. Today I am going to release the first wallpaper of a second series, once again featuring Firefox. I am probably going to update this blog entry in the next couple of weeks and add more wallpapers as soon as they are finished. Hmm… I have a 2560×1600 screen, any plans on making a bigger version? Starting with Titanium, I am going to offer more different resolutions. Previously I only created the following resolutions: 800 x 600, 1024 x 768, 1152 x 864, 1280 x 960, 1280 x 1024, 1400 x 1050, 1600 x 1200. New resolutions include one higher resolution 4:3 wallpaper: 2048 x 1536, and also various resolutions of widescreen wallpapers: 1280 x 800, 1140 x 900, 1680 x 1050, 1920 x 1200 and 2560 x 1600. I have a dark scheme and this fits perfectly. Perhaps a very small color logo in one of the corners would look nice too. Would like to see Strings (especially the light version) without the small logo. That be perfect! Awesome. I can’t wait to see what kind of stuff you’ll be cranking out in the next few weeks. On second thought, I disagree with myself about the color logo. It is better to "keep it clean" like Simon said. As an alternative idea, how about a large faded titanium background with a small titanium upper corner logo(circle -world-fox)? Or just a plain titanium background with a small upper corner titanium logo. I use this at work so the less clutter the better. You have probably already conceptualized better stuff than what I mentioned but whatever. I look forward to seeing more titanium. Trying to get ahold of you is hard. I’d like to know if you authorize me using the code of your red and anti-ie bar. Of course, I’ll credit you. My site is in brazilian portuguese and I’d like to make a translation too. Is it possible? Very nice, I’ve been using 2 of your wallpapers since you released the first set. I’m rather tempted to change one of them to Titanium. Muito legal mesmo esse seu "weblog". Essas transparência ficaram muito legais! E quando as pessoas abrem no "IE" aparece a mensagem.. Muito show! where i can download the Firefox "FONT"
Why only Fox?! Yeah, it’s cool, but I use Mozilla, so I love it some more.. 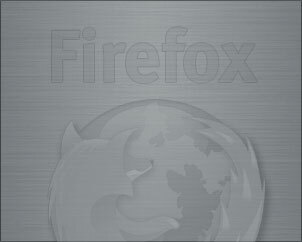 I want such wallpapers with Seamonkey (Mozilla)! Beautiful. Thank you very much.